This is an occasional blog with tips and notes for amateur boatbuilders, to help with decisions that must be made before and during a boatbuilding project, as well as after launch. Post content will be quite random, depending on what is on my mind or what questions I am being asked by my builders at the time. Most people who work with wood will have their own preferences in adhesive types and methods. What I am writing here are my opinions, based on my own experiences and observing my designs as built by others. 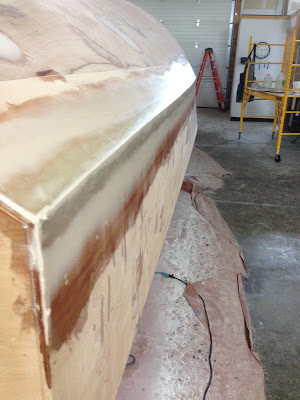 Epoxy is sometimes viewed as a miracle material for boatbuilding, particularly by amateur boatbuilders. It is a good and very useful material but, as with everything else, it must be used correctly if it is to do its job as intended. Use it incorrectly or for the wrong application and you may have big problems on your hands. This post is primarily about epoxy adhesives, not epoxy coatings. Epoxy adhesives are fairly thixotropic, i.e. they have a consistency that does not allow them to flow easily. They have gap-filling properties, which means that they have the ability to stay in the joint and fill in the gaps. But that gap-filling has limitations, it can't be counted on to compensate for your bad woodwork. Go beyond that gap-filling ability and the joint may be seriously compromised. Each type and brand of adhesive behaves in its own way and the differences in characteristics must be taken into account when fabricating anything with them, if they are to perform as intended. Epoxy does not like surface-to-surface contact. There should be a very thin layer of epoxy between the surfaces being joined to get maximum bond strength. With a very thin layer the bond is strong but, if the epoxy layer is too thick it can be brittle and might be easily broken. In contrast with epoxy, resorcinol needs wood-to-wood contact for maximum strength and likes a tight joint. That doesn't mean that you should build sloppy woodwork just to get epoxy into the joint. I am not the world's best woodworker but I try to make my joints as neat and close-fitting as I can, gluing them with resorcinol rather than epoxy. I take pride in making neat joints with minimal slop in them. That is the way to build a strong boat that will give you years of happy seafaring. I have been reminded of this in recent years when discussing past modification work done on the Didi 38 "Black Cat" with her current custodian, David Immelman. He has told me numerous times that he always knows when he is taking apart some piece of the original structure that I built more than 20 years ago. He battles to take apart my neat and well-bonded work, whereas structure added by others employed by the owner often comes apart rather easily. I have seen that modification work and some of it is rather sloppy. If the visible parts are to a low standard then it is anybody's guess how bad the hidden parts might be. I occasionally see woodwork that seems to have inexplicably deteriorated or joints that are separating or have come apart. Inspection or investigation can generally come up with explanations or possible reasons for the deterioration or damage. An example is a boat to our MG30 design, with transom-hung rudder, which was racing and moving fast. Her rudder came off, taking a large portion of the transom with it. In the absence of answers, the discussion about the damage was coming to the conclusion that plywood construction was just too weak to take the loads of sailing at high speed. I was many thousands of miles away but was approached for my opinion. After seeing photos of the rudder I queried a mark on the leading edge, suggesting that it could be whale skin. That is what it proved to be and the investigator found crew from other boats who reported seeing blood in the water after the incident. The rudder, with small mark half-way down the leading edge, which proved to be whale skin. So the damage was due to collision with a whale but why did the transom rip out instead of the rudder shearing or the hardware being ripped out of the transom? I asked for detail photos of the perimeter of the transom and the hole in the stern. They proved very enlightening, with evidence of incomplete or non-existent bond in places. This plywood knee is housed into the inside of the transom doubler. The aft face of the knee is glossy, showing that it was not in contact with the back of the groove into which it was glued. The bond was only with the end grain edges of the plywood groove in which it was housed. That end grain was easily fractured by the impact loads. This is the groove in which the knee was housed. Again, there is no sign of a bond between the knee and the back face of the groove. The partial damage to the plywood sides of the groove indicates that the sides had only partial adhesion as well. As can be seen in the photos, the aft face of the knee and the matching face at the back of the groove in which it was housed were both coated with epoxy but they were not in contact with each other. The two coatings were not able to bond to each other. The knee needed more pressure to push it against the back of the groove. There is a similar problem at the top of the transom where a deck stringer is housed into the transom doubler with only partial bond. The test when dry-fitting a joint that will be glued with epoxy is that the two parts should fit together easily, with one part sliding easily into the other with no pressure and minimal wobble. If you need to use a hammer/mallet or a clamp to force the parts together then it is too tight. There will be no space for the glue that is supposed to make the joint permanent and the glue will be scraped off the surfaces as the joint is closed. Trim a little material off to give a better fit. If there is more than just a little wobble then you have too much space in the joint for the glue to fill. Rocking of the wood while positioning the joint can force some of the glue out of the gaps and leave air pockets, which will weaken the joint. When gluing two flat surfaces of wood together or plywood against wood framing, you need good, clean and matching bonding faces. A rough-sawn surface might seem good for bonding because it has lots of roughness for the adhesive to grab onto but it is likely to have many highs and lows, creating gaps that will either be filled or left as air pockets. It will have many loose fibres and splinters that will damage the bond if the epoxy doesn't envelope the fibres, to bond them to the base wood as well as to the other half of the joint. The coarse surface will also wick epoxy out of the adhesive, leaving the filler with reduced epoxy and the possibility of a dry joint. Slightly rough is fine as long as it is clean and dust-free. A clean planed surface is good for holding power, with the epoxy able to penetrate into open pores on the surface. Sanding the surface can weaken the bond because sanding dust may clog the pores, reducing penetration into the surface. Blow off any dust before gluing because a dusty surface can destroy the bond in patches. The bond will also be badly compromised by contamination from dirty rags, sweaty hands and even the exhaust gasses from diesel engines running nearby. A builder recently sent photos of the wing of his Paper Jet skiff, which has some cracking of the epoxied joints within a year of first launch. He had got water into the wings due to a building error and a leaking drain plug. He felt that this had soaked into the wood, swelling it and cracking the joints. But all surfaces inside the wings are sealed with epoxy coatings, so water should not have been able to get into the wood unless he didn't coat those surfaces as instructed. This is the outer corner of the leading edge of the wing. The wood-to-wood epoxy joints have cracked. This is the aft end of the wing, where wood-to-wood joints have also cracked. The bond of epoxy adhesives and coatings to wood can break down if the wood becomes saturated with water, allowing joints to crack or come apart and coatings to peel off. That weakening of bonds doesn't happen with resorcinol, which continues to cling to soaked timber. I don't think that the cracking in these photos is from wet wood though. Happening so soon after launch and cracking the way that it has, I think that the cause of the cracking lies with the epoxy in some way. There are various possibilities. 1) The epoxy may have been old stock, with the heavier components settled to the bottom and the lighter ones risen to the top. If this happens and the epoxy is used without first thoroughly blending the contents of each can, the resulting mix may never cure properly. Always stir or shake your epoxy containers before you take material out for mixing. This will ensure that you always have all chemicals in the correct proportions, not just those that are at the top of a newly-opened container or the gummy dregs at the bottom of an old unmixed container. 2) The epoxy may not have been mixed properly. Some epoxies mix easily and don't need a lot of attention to the timing nor the process. Others are more demanding, needing more time to mix very thoroughly. I have had personal experience of this when I used an epoxy coating that needed 5 minutes of mixing when I was accustomed to about half that time. It seemed to cure but the polyurethane paint system applied over it cracked after a few months, alerting me to a problem. I was able to peel the whole lot off with the aid of a hot air gun, finding soft epoxy under the hard paint. That epoxy, if used as an adhesive, would not hold the pieces together. 3) Too much filler additive in the epoxy can lead to weak dry joints if any of the epoxy migrates into the wood. A coat of unfilled epoxy applied with a brush and allowed to soak in for a few minutes, before adding a thin film of filled epoxy, will prevent this from happening. 4) Some builders pre-coat all wood before assembling the boat. Pre-coating the surfaces to be joined with epoxy is OK if the joint is completed within a few hours, when the adhesive in the joint can still cross-link with the initial coating to make a chemical bond. Left longer than 12 hours it needs to be sanded to help the adhesive to grab onto the coating but it will be a mechanical bond, much weaker than a chemical bond. It would be better to mask off the gluing areas when pre-coating plywood and framing so that the epoxy joints can be made on virgin wood surfaces. It takes a lot of time, effort and money to build any boat. It is heartbreaking when things go wrong and repairs are needed to the beautiful product of your work. 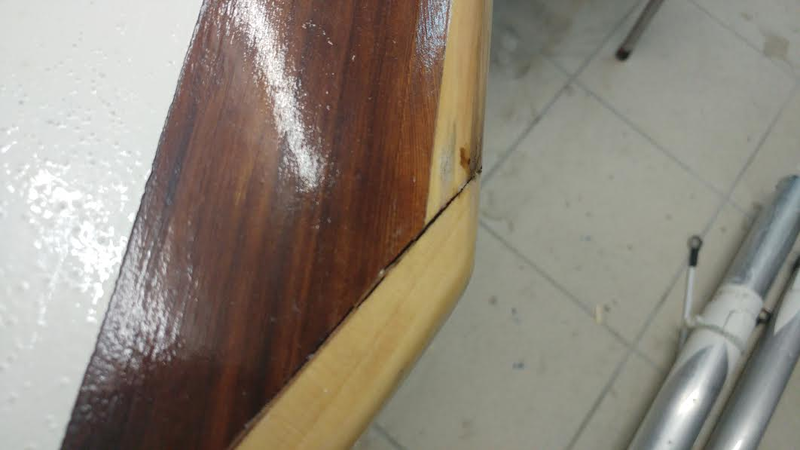 Don't let careless jointing and epoxy habits damage your work. This started as a post in the series on building the Argie 15 on Dudley's Blog. It became too long and involved for that blog, so I simplified that post and left the more in-depth information for this post. The first part of making any wooden yacht foil, whether a rudder, daggerboard, centreboard, keel, leeboard or whatever, is to make the blank that will be the material of the core. For the Paper Jet I used cedar or poplar planks, depending on the size of the particular foil, edge-glued to each other to achieve the required width. 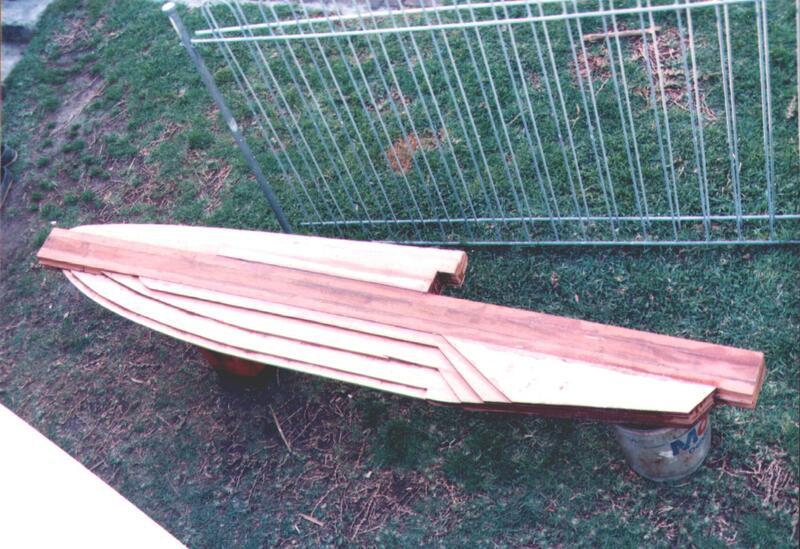 For the Argie 15 we used a combination of cedar and poplar strips that were cut from planks. These were laminated to take advantage of the colour differences of the two species to produce very attractive striped foils. For some designs we use multiple layers of plywood, bonded together. This post is mostly based on the striped poplar/cedar boards of the Argie 15. Gluing blanks for the Paper Jet foils from cedar planks. Click on the images to enlarge them. Laminating the Argie 15 daggerboard blank from strips of cedar and poplar. The blank must be as straight and flat as possible. That means keeping the strips or planks all in the same plane, without steps at the joint lines. Any variations will reduce the thickness available for shaping the foil because it must first be sanded flat on both sides. Once glued-up, smoothing of the blank can be done with a belt sander with a coarse belt (80-100 grit), a hand plane, or a combination of the two. If you have a planer/thicknesser available with enough width for the foil that you are shaping then that is the obvious tool to use. A note about sanding belts would be appropriate at this time. Your belt sander will remove a lot of wood before your foils are fully shaped, so it is worthwhile to pay a bit more for good quality belts that will last the task. I used an 80 grit ceramic belt that is expensive compared with conventional belts but well worth the extra. Whereas conventional belts wear out and normally get thrown away because they have lost their cutting power although still in one piece, my first ceramic belt was still cutting well when the joint parted, having already lasted about as long as five conventional belts. When the blank is true and flat, draw the outline shape onto it and cut it out with a jigsaw or bandsaw. If it has a rounded toe, don't round it off at this stage. Cut it with a sharp corner because this will make it easier to draw the foil section correctly. The blanks that Kevin laminated for me had been cut to shape already before I received them, so the photos of the striped foils in this post have the toes already rounded. Leave cutting the rounded toe until the foil has been shaped. Once the outline shape has been cut, mark onto the surfaces both sides the part of the foil that will be shaped to a foil section shape. For a daggerboard or centreboard this will normally coincide with the bottom of the hull. 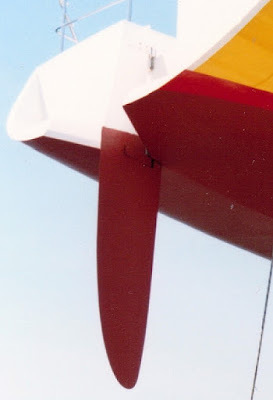 For a rudder it is normally aligned with the bottom of the rudder stock. The next step is to mark the foil section shape on the bottom edge of the blank. First draw lines exactly along the centreline of the blank along the forward, bottom and aft edges of the blank. When shaping the blank, make sure that you don't lose these lines, redraw them in exactly the same position at any time that they are becoming faint from sanding etc. If your plans have foil section patterns then cut each out as a rectangle large enough to fold down both sides of the blank to secure it. Position the pattern over the bottom edge of the blank exactly aligned with the centreline of the pattern on the centreline of the blank, with the trailing edge of the pattern at the aft edge of the blank. Tape the pattern securely in this position or hold it down with push pins. Paper Jet rudder foil pattern wrapped over bottom edge of blank, ready for transferring the shape. Using a bradawl or push pin, prick through the pattern along the lines that show the section shape, making holes in the wood. Make the holes close enough on tightly-curved sections to clearly show the shape but they can be further apart where the shape is more straight. Remove the pattern from the blank, then draw the curve by following the holes pricked into the wood. That gives you the shape for the bottom end of the blank. If the foil that you are shaping is foil-shaped all the way to the top then repeat the process at the top of the blank. That will set you up to shape the ends exactly to the patterns and to use a straight-edge to ensure that all points between the ends are also shaped correctly. To do this, rest the straight-edge on the foil, aligned so that each end is at the same relative position on the two ends of the foil, eg. 25% from leading edge at both ends. The surface should be straight top-to-bottom, so you should feel no end-to-end rocking of the straight-edge (indicating a convex surface) nor should you see any light between the straight-edge and the foil (indicating a concave surface). Use this as your guiding principle when shaping the foil. If your foil will not be shaped all the way to the top then you need to make a template to show the foil section shape at the top end of the shaping. This can be from plywood, stiff cardboard, plastic or sheet metal. It must have a concave edge accurately drawn and cut to the foil shape so that you can lay it against the foil to check that you cannot see light between the template and the foil. If your foil doesn't have straight leading and trailing edges, i.e. the plan shape is elliptical or curved along the leading and/or trailing edges, then you cannot use a straight-edge to check fairness. The surfaces will be curved instead of straight as long as at least one of the edges is curved. In that case you will need to make multiple templates, showing the shapes at various positions. Mark all of those positions accurately with small diameter holes drilled deep into the surfaces near to the leading and trailing edges, so that you won't lose the positions by sanding. (These holes will all be filled with epoxy when the coatings are done later.) Check the templates against the foil frequently while shaping, to give you accurate shapes at those points. For the spaces between the templates you can rely on your senses of sight and touch to get a smooth surface. This is the rudder of the CR33 design, with locations of templates used for shaping. The green curves are template shapes and the red lines connect the points of maximum thickness. In this case they are straight lines because the leading and trailing edges are straight lines. That makes it possible to use a straight-edge to check accuracy of the foil shape. The next line that must be drawn onto the blank before shaping begins is the location of maximum thickness of the foil. This position will vary depending on what section shape is being used but is normally from 30% to 35% aft of the leading edge of the foil. The exact position of maximum thickness comes from carefully researched and documented shapes that produce the least drag under different operating conditions. The roots of the research methods date all the way back to wind tunnel testing by early aircraft pioneers like the Wright brothers and have been refined over the past century and more by NASA and other authorities. They have tested hundreds of shapes to establish their lift/drag characteristics for designers to compare and select what will best suit what they are designing. That research was for aircraft but is equally valid under water as above. Sailboats have three or more wings, some operating in air in the form of sails, the others in water in the form of rudder, keel etc. Sailboats are the only forms of transport that operate with wings in two different media, in the process deriving power and motion from both. OK, back to the foil section and marking the point of maximum thickness. Look at the two sections in the diagram below. Both are the same chord length (distance from leading to trailing edge). Leading edge is to the right, trailing edge to the left. Both are the same thickness but the points of maximum thickness differ. The upper section is a NACA 000 series foil, which has maximum thickness 30% aft of the leading edge and it is fairly full in the forward sections, with almost straight lines fairing into the trailing edge. The lower section is a NACA 64A series foil, with maximum thickness 35% aft of the leading edge, finer forward sections and slightly hollow (concave) surfaces fairing into the trailing edge. NACA 000 series at the top, NACA 64A series at the bottom, with very different distribution of the thickness. For us operating a sailboat, we may not feel a difference between the two shapes as they move through the water but they make a difference to performance. The 64A section creates less drag than the 000 section when water flow is closely aligned to the direction of travel through the water but it stalls out easily at low speed and also if the direction of flow diverts more than a few degrees from the centreline of the foil. In contrast, the 000 section can divert a lot further out of alignment with the water flow and it is much harder to stall. The water, if coming from a few degrees off to one side, can flow more easily around the more rounded leading edge of the 000 section than the sharper 64A section. That makes the 000 section more forgiving. The result of these differences in characteristics is that the 000 section is well-suited to rudders because they are out of alignment with the water flow most of the time, alternately out of alignment to one side or the other, due to helm corrections. It is also suitable for keels on slow boats that can benefit from increased lift at low speeds. The 64A section is best used for keels on fast boats, to benefit from the lower drag. Mark the point of maximum thickness onto both sides of the foil at each template position. If your foil has straight leading and trailing edges, draw a straight line connecting the points at top and bottom of the foil. If the foil has multiple templates then use a flexible batten to draw the curve that connects all of the points of maximum thickness. These lines are important for guiding your accurate shaping of the foil, so don't sand them off. If they start to fade while you work then draw over them again to keep them clearly visible. Don't sand them off until you are happy that the shaping is complete and you are doing the final clean-up before coatings start. Our Argie 15 daggerboard with the upper limit of the shaping marked with a line across the board and the line of maximum thickness drawn lengthwise on the board. The area in front of the maximum width is curved, so it is most easily shaped with a sharp hand plane, taking off a fairly small amount at a time. This tool gives good tactile feedback to your hands so that you can judge the angle that the blade is removing wood and also where there are lumps and bumps. You can feel this through the changes in angle of the plane against the wood, along both the length and width of the plane. The plane allows you to gradually work down to the template shape in very small and accurate increments. The area behind the maximum width is fairly flat and needs a lot of material to be removed. Here I find that a 3" or 4" belt sander is the most useful tool. An 80 grit belt will remove a lot of material quite quickly and with good control. The long base plate gives a good flat surface to remove material over a large footprint, without lumps, bumps and gouges as happens with a disk sander and much faster than can be done with an orbital sander. As with the hand plane, the belt sander gives tactile feedback that can be felt through the hands as minute changes in angle that can identify mounds, hollows and other irregularities in the surface. The belt sander can be used with the belt cutting along the length of the foil, across the foil or any angle between. It can also be moved in any direction relative to the direction of belt movement, so you can use it with the belt running across the board but the sander moving sidewards along the length of the board. This gives your hands feedback about changes in surface angles both along the board and across it at the same time. Back to the actual shaping process, initially you can use rough-and-ready methods to remove excess material. 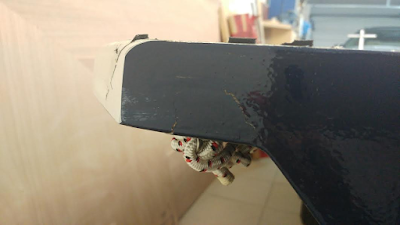 If you are shaping a large rudder or daggerboard then a power plane can remove a large amount of material very fast but be wary of this machine, particularly if the foils are dinghy-size. It is a brutal machine that will very quickly turn your intended foil into scrap firewood. Use it only for rough-forming the blank then put it away. I prefer to keep it away from dinghy foils. The closer that you progress toward the final shape, the more gentle and controllable the method used must be. With a belt sander, change to a finer belt so that it will remove less material with each pass. After that change to sanding by hand with a firm sanding block with the sandpaper wrapped around it or sandpaper folded double without a block. Whichever method you use, do it with a light touch. If you push hard against the surface you may feel large irregularities but you won't feel the small ones. The lighter your touch the more you will feel the smaller variations in angle that identify highs and lows in the surface. Working with a light touch with a wood plane or a belt sander you will feel changes in angle through changes in pressure transmitted through your hands into your arms. With practice and by paying careful attention to what your hands and arms are telling you, you will be able to shape surfaces that are surprisingly smooth and accurate. Stop working every now and then and run a hand lightly over the surface, with your fingers "loose" and able to follow the surface. You will feel variations that you can't even see. Eventually you will arrive at a smooth and regular surface that closely follows the templates. If your foil is full-length of the blank, your shape will now be down to the lines that you drew onto the ends of the blank and your straight-edge will show a straight surface between the ends. If your foil has multiple templates then you will be able to set each template against the surface in the correct position and see no light coming through between the template and the surface. The Argie 15 daggerboard with shaping completed, ready for glassing. It is up to you to decide how close you want to get to that perfect surface. For a racer where every second counts and all unnecessary drag must be eliminated, work to achieve a perfect surface. For a family daysailer that is built for fun above speed, work to a level of accuracy and finish that makes you happy. If you will laminate the foil blank from plywood then you have the opportunity to save plywood. To do this, cut each layer of plywood only as large as needed for that particular layer. Only the centre layer is full size, all others will each be smaller that the layer inboard of it. Laminate in layers that are stepped down in size as you move outward, reducing the area of plywood needed and also the amount of waste material that must be removed. Draw the plywood layers onto your templates to establish where the edges of the layers need to be. You can also use the layers of veneer as a rough guide for shaping a smooth foil. I say a "rough guide" because there are often tiny variations in the thicknesses of the veneers, particularly with less expensive plywood. Those tiny variations can result in wavy lines when exposed at the small angles that result from shaping a foil. Trying to smooth out those lines will result in an inaccurate shape. This is the rudder blade of the Didi 38 "Black Cat". It has a central shaft of solid iroko, with plywood leading and trailing edges. I laminated only enough plywood to get to the surface of the finished rudder, reducing the amount of waste that I had to shave off. This rudder is big enough to have most of the shaping done with a power plane and the finer shaping with a belt sander. The completed rudder on "Black Cat". The trailing edge needs special attention because it can be the source of vibration that can transmit itself throughout the boat. That vibration is caused by turbulence off the trailing edge in the form of eddies flowing off one side then the other, then back again in a repeating sequence. The eddies and the vibration create a large amount of drag, so much that one can feel the braking effect on the boat as soon as it starts. Eliminate the vibration by shaping the trailing edge in a way that it will not generate those alternating eddies. One way to prevent the alternating eddies is to shape the trailing edge perfectly, to a clean and sharp edge, with no rounding off. This is an easily-damaged edge though, so it is normal to have a very narrow flat instead of a knife-edge. It is normally OK also to have a very narrow flat filed onto the trailing edge, 1-2mm wide, with a sharp corner both sides. If the edge is 3mm wide and the corners are rounded you will likely get vibration. Another way to stop the alternating eddies is to purposely create an imbalance between the two sides of the foil. This will make the eddies consistently flow off the one side and not the other, so no vibration. The way to do this is to either file the flat onto the trailing edge at 45 degrees to centreline instead of 90 degrees, or to round off one of the corners of the trailing edge and leave the other one sharp. This post is already very long, so I will leave glassing the foils for a separate post in a week or two. To see our boat designs go to our main website or our mobile website. Amateur boatbuilders are able to create boats of remarkable quality, sometimes rivaling the finishes and detailing that comes out of the best of professional boat shops. Having built a few boats myself, I know that I have the experience and the skills to do work that is as good as many professionals, as long as I stick to fairly standard detailing and don't try anything very fancy. I see work of similar or better standard from other amateurs but I also see some boats that are somewhat "agricultural" in appearance, with very rough finishes. Much of the problem is related to being unaware of, or ignoring, some fairly basic principles that will make a big difference to the finish without adding a lot of work. It is worthwhile to do as good a finish on your new boat as you possibly can. The extra effort will pay off later in the price that you can get when you want to sell it and also in the level of pride that you will have in your boat when using it and when showing it off to others. You will put in a lot of time and money creating this boat, which may be wasted if your boat is sub-standard. The cost won't be any different if you follow these tips but the standard will improve considerably. So, be good to yourself and do a good job of the build. Interior of Hout Bay 33 built by Sergey Fedorov in Russia. Note the lack of sharp corners on all of the woodwork, giving a soft appearance and a feeling of quality. In no special order, here are some tips to help you to create that high standard of finish. 1) Sand wood rather than coatings. It is easier to get a smooth finish on wood than on epoxy, paint or varnish. Do yourself a favour and get the wood as smooth as possible before you apply your first coat of anything over it. This will give you a good foundation on which to build a nice standard of finish on the coatings that will come later. 2) Round off all external angles. Here I am talking of the exposed corners of framing, trims, bulkheads etc., in fact every external angle in the boat. There are multiple reasons for this. First, it looks much nicer, due to softening the appearance by removing the visual harshness of the sharp corners. It allows the coatings to adhere better and be of more constant thickness so that they give maximum protection. Paint and epoxy is pulled away from hard edges by surface tension, leaving those edges with minimal cover and protection. Rounding them off allows the coating to spread itself around the corner, for a smoother finish. It removes the sharp corners that can cause damage to human skin and bone if fallen against at sea, bumped when cleaning bilges or getting items out of lockers. Those sharp corners can also damage hoses, electrical wiring and other items of boat equipment due to constant movement and chafing at sea. Rounding off the corners of framing like stringers, joinery cleats and trims is most easily done before installing them in the boat. Do so with a router fitted with a 6mm radius corner round bit on all edges that will be exposed on the completed boat. The simplest way to do this is to use a router table, with the router mounted below and the wood run through the cutter on top of the table. For corners of bulkheads, lockers etc. use a 10mm radius corner round bit on a router than can be run along the edge of the plywood. Don't think that just because an edge is inaccessible it doesn't need to be rounded off. If you want that piece of timber to have long-term resistance to rot then it needs as much protection as you can give it. That means rounding the edges then coating properly with epoxy, even if you will never see it again. This DS15 was built by Jim Foot in South Africa. This boat has a wet deck, with all spaces under the deck sealed in and never to be seen again. Nevertheless, all corners have been nicely rounded and all wood surfaces are smooth, ready to take the epoxy coatings. This ensures effective protection for the timber and improved durability of the boat, as well as higher resale value. There is no sensible reason to use timber that is rough on any exposed surfaces. Rough surfaces have many little exposed corners, so coatings will run away from those corners, just as they do from edges that haven't been rounded off. You also increase the risk damage to skin, hoses etc. as described above. You can buy wood that is planed all round, in the sizes that you need them to go into the boat. However, that is the expensive way to build a boat. It is normally cheaper to buy your timber in wider planks then cut them down to size yourself. Buy a table saw to do this job, it is a valuable piece of equipment for a boatbuilding project. Fit a carbide-tipped blade with 40-50 teeth. That will rip the wood quickly and leave surfaces that need minimal or no sanding. The saw doesn't have to be a big one, costing loads of money and needing lots of space in the workshop. I built the CW975 "Concept Won" using a skill saw mounted under a portable saw table. When not needed I could pack it away while I did other work. At the other extreme, I built the Didi 38 "Black Cat" using a very nice radial arm saw. For large boat projects it is worthwhile to buy a bench belt sander with 4" wide belt, which will allow you to run framing over the top of it to remove any roughness if needed. 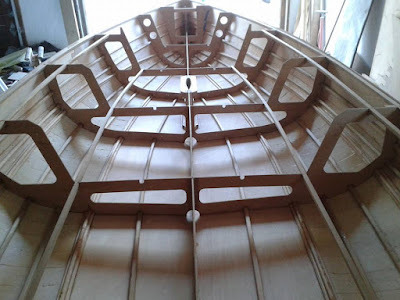 It will also allow you to sand smaller items to a nice finish before fitting them into the boat and to fine-tune the ends of smaller pieces of framing that need to meet neatly at intersections. Attention to these smaller details will make a big difference to the professional appearance of your boat. Don't sand any frame surfaces that will be glued, rather leave those surfaces slightly rough or clean-cut. Sanding will block the pores of the wood, reducing penetration of whatever glue you use, thereby weakening the bond. 3) Take care with fillets. Take care and time to make your epoxy fillets constant in radius and shape. A fillet that sags is not pretty and is also weaker than one with a smooth curve that feathers out against the two surfaces that it connects. That can sometimes be difficult to achieve because a high density fillet formed with epoxy, cabosil and wood flour cures very hard and is hard to sand. A little too wet a mix and it will sag, whereas too dry a mix drags when you run your filleting tool over it. A low density fillet is easier to sand out imperfections after it has cured. It is not as strong, so must be larger for equal strength. If you have an ugly high density fillet and can't rework it to look better then add a low density fillet over it to hide it. Sand your wood surfaces before applying the first coat of epoxy, paint or varnish. After that blow off all dust with compressed air or vacuum it away. If you don't, you will be rolling dust and wood fibres over the surface when you work. They will be set into the coating and stay there, creating bumps and texture on the surface. The only way to remove this will be by sanding the coating before applying the next coat. Some of the surface fibres of the wood will often stand up when the first coat is applied. Don't ignore this and paint over it, this will require more coats to cover it. Instead, it will need only a light sanding to smooth the texture before applying the next coat. Sand lightly between coats if more time has passed than the over-coating time recommended by the manufacturer. For epoxy this is normally 12 hours, for paint it varies. It is also worthwhile to do a chemical wipe with acetone or mineral spirits to remove any surface contamination that may have come from skin contact (body oil in the shape of hand prints may be the most common form of inter-layer failure in painting of cars, boats and furniture) or other sources of contamination. A diesel generator running nearby can ruin your paint job due to oils in the exhaust gasses raining down on everything downwind of it. If the boat that you are building has glass-taped joints or areas that are reinforced with fibreglass, sand the edges of the glass to a feather edge then apply a final coat of resin to fill the weave and seal any exposed fibres. Fair the glass surfaces where needed with epoxy fairing compound, as well as along all edges. The fairing should be no thicker than needed to fill any hollows, with minimal thickness over the humps. Sand it smooth to make the glass reinforcement disappear into the surface once it has been painted. This is the chine of the Didi 950 being built by Mike Vermeersch. It has 2 layers of glass tape, which has been sanded to feather edges, faired and sanded smooth. The finished chine with epoxy primer, ready for paint. Achieving a great finish on your new boat should be a major goal. You will experience much more pride and pleasure from a boat that looks really nice than one that is very obviously an amateur build due to inferior surfaces. Challenge yourself to work to the highest standard of finish that you can. You will surprise yourself. To view our designs, go to our main website or our mobile website. I have been designing boats professionally since 1979 when I won the Cruising World Design Competition. As an amateur boatbuilder myself, my roots are in amateur boatbuilding. I have drawn many designs that are suited to building by amateurs and even first time builders. My preference is for fast boats, so even my cruisers display a good turn of speed. The views and opinions expressed in this blog are those of Dudley Dix and are simply views and opinions. Dudley Dix takes no responsibility for any decisions or actions that may be taken by the reader after reading this blog, such decisions and actions are entirely the responsibility of the reader. This blog is the copyright of Dudley Dix and Dudley Dix Yacht Design. Picture Window theme. Powered by Blogger.